Not too long ago we spent half our hours in smoking darkness. Candles, oil lamps, then kerosene lamps followed. Just in time for indoor plumbing to make its appearance. After the glory of a home with a pump in the kitchen came water delivered via pipe into the residence. Next, the most amazing of inventions, hot water showers! With us just about the whole way, from 1865 at least, Bridgeport Brass Company supplied the tools, devices, and materials to make it happen. A few years after The Great War local farmland was consumed by developers. The new crop of housing sprouted faster than summer corn. About the same time our pile of bricks was hurriedly stacked, a more ambitious heap was raised up the hill. Three stories of cells, each to have both cold AND hot water. The water pipe? Brass pipe manufactured by Bridgeport Brass Company of Bridgeport, Connecticut. Shaft-mounted roller dies had stamped a repeating trade name along the length of the pipe. Plumrite. Decades later discovered disconnected within wall cavities, a usefulness lost to cracked threads after its three-generation life expectancy, a few feet of Plumrite are saved from the scrap yard. 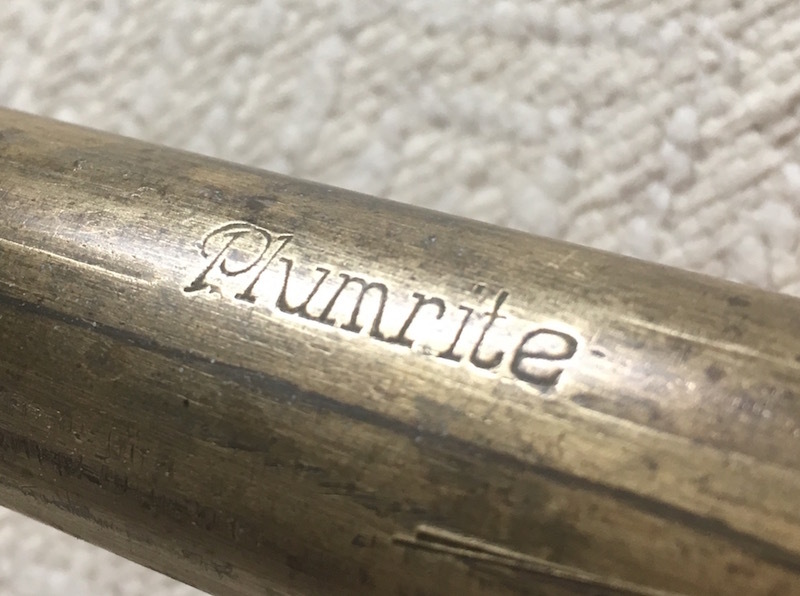 Here we have a piece of c.1928 Plumrite brass pipe in use as a pipe clamp. Certainly lends a touch of patrician elegance to the old chap, what? Genteel, experienced, ready to fasten together the most fractious of violin tops with good manners and charm. This entry was posted in Craftsman / Artist and tagged Bridgeport Brass Company, Plumrite, Pony Pipe Clamp, W O Laughna Art Publishing C NY.